Pottery Avenue offers this Polish Pottery Stoneware 9.5” high Canister. The Canister is a wonderful hermetic jar that can be used to keep a variety of goodies. This Polish Stoneware is beautifully handmade and painted by skilled artisans of Zaklady Ceramiczne “BOLESLAWIECE” in an attractive round base shape. 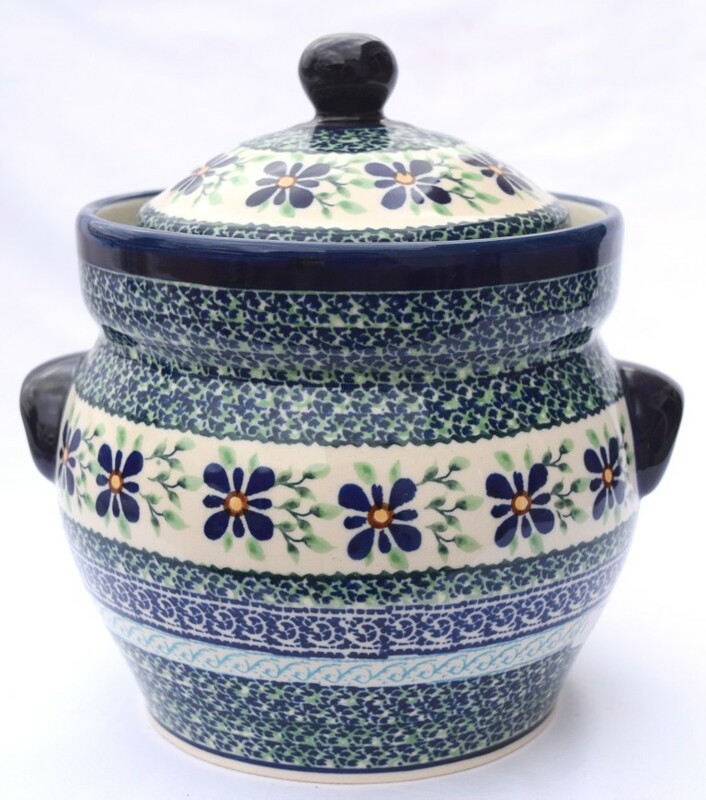 Pottery Avenue offers this Polish Pottery Stoneware 9.5” high Canister. The Canister is a wonderful hermetic jar that can be used to keep a variety of goodies. This Polish Stoneware is beautifully handmade and painted by skilled artisans of Zaklady Ceramiczne “BOLESLAWIECE” in an attractive round base shape. The covered lid jar keeps the contents airtight and enhances the decorative appeal of this functional handcrafted Stoneware piece. It features twin handles on the sides to conveniently hold the container. This Polish art Pottery Stoneware is microwave, dishwasher, freezer and oven safe up to 450 degrees F. It is also lead and cadmium free. A national treasure, Boleslawiec ceramics have been manufactured for centuries. Developed from natural ceramic clay that can be found near Boleslawiec at the Bobr and Kwisa rivers. According to historical sources, the first stoneware was made in medieval times and in the early 16th century, local potters formed guilds to ensure perfection. Zaklady Ceramiczne "BOLESLAWIEC" was founded by one of the original men with the first pattern dating back to 1759. “DEAREST FRIEND 12-cup Canister“ is an ARTISAN pattern based of the 300 year old pattern "EYE OF THE PEACOCK". Designed by top designer and imported by Pottery Avenue, the premier importer of Polish Pottery & Polish Stoneware.